When I saw this recipe in last month’s Bon Appetit magazine, I knew it wouldn’t be long until I’d make it. 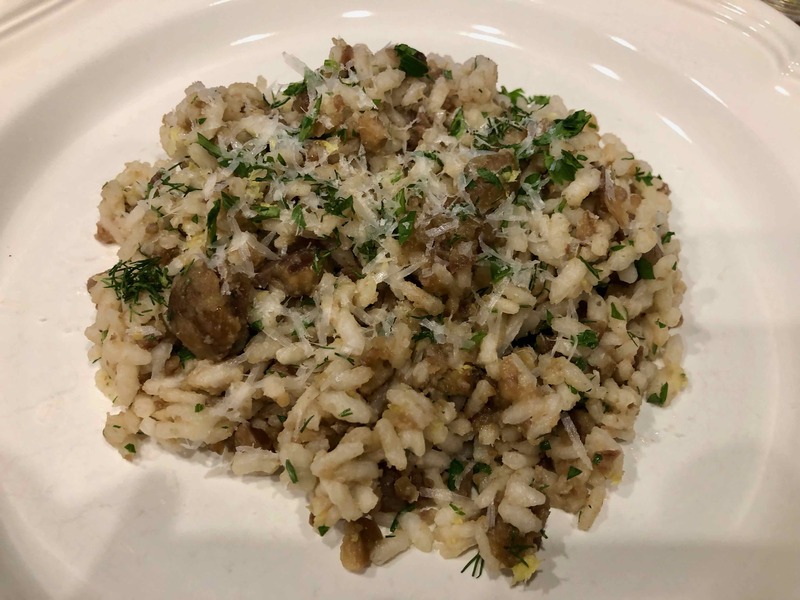 What most attracted me to it were the golden raisins and pine nuts, ingredients that, when paired with swordfish, whispered my mother’s native Sicily. 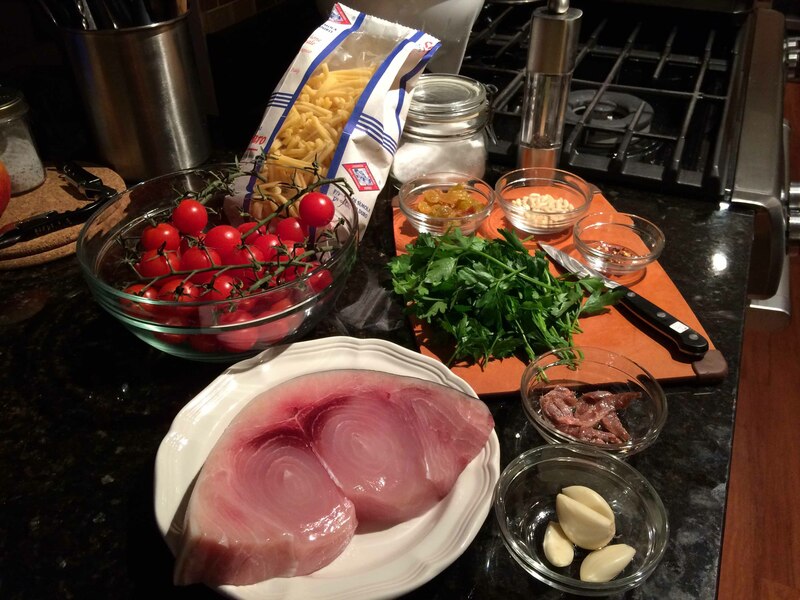 Finding a great piece of swordfish and some beautiful hot-house cherry tomatoes at the market yesterday reminded me of the recipe and so here it is. I followed all of the instructions but toasted the pine nuts ahead of time. I also decided to add some of the raisins and pine nuts to the sauce rather than sprinkling all of them on at the end. My only cautionary note would be to hold off on adding the 1/2 cup of pasta water at the end. 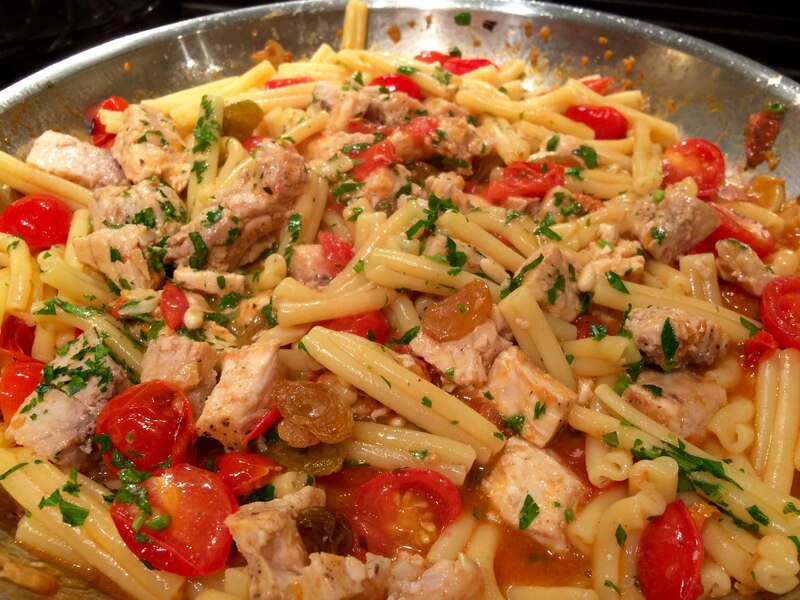 Wait until you’ve almost finished tossing the pasta with the sauce. A tablespoon or two might be enough. pepper flakes, stirring occasionally, until anchovies disintegrate, about 3 minutes. 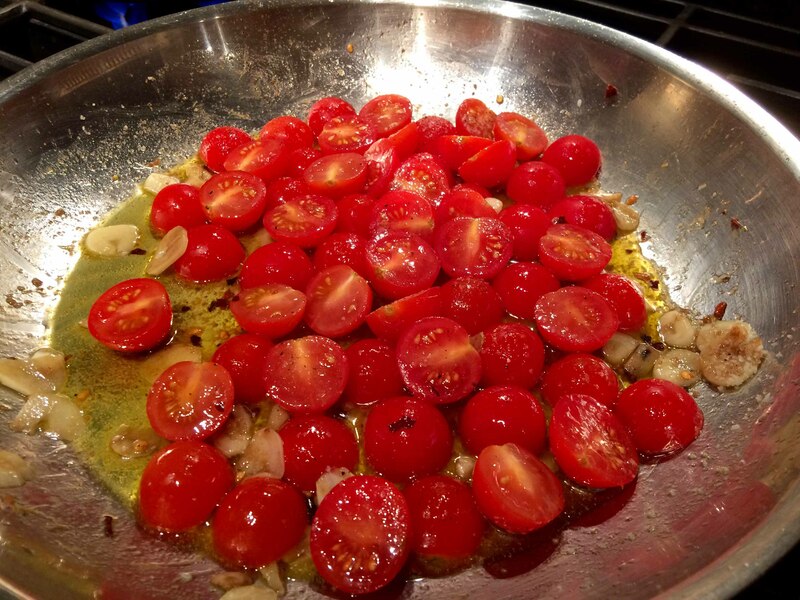 Add half of tomatoes; season with salt and pepper. Cook, stirring occasionally, until sauce thickens, 12–15 minutes. 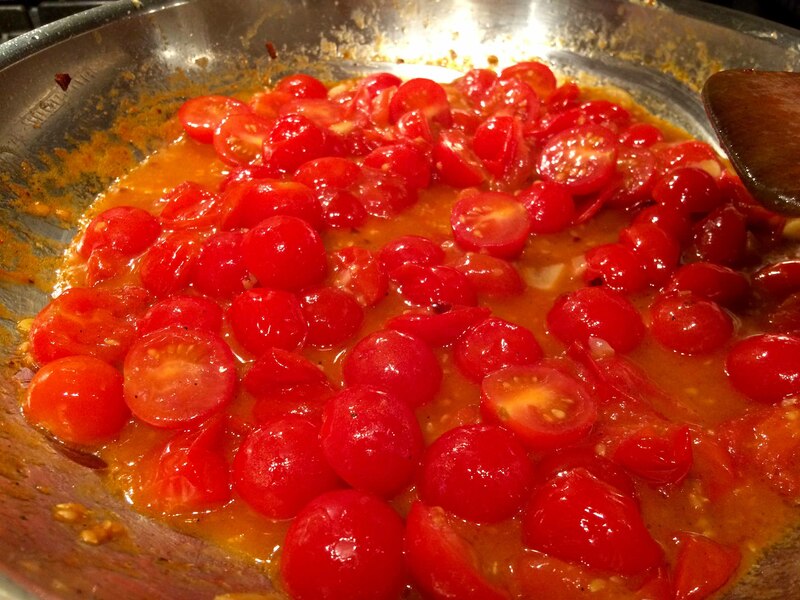 Add remaining tomatoes; remove from heat. brown, about 4 minutes. Let cool. 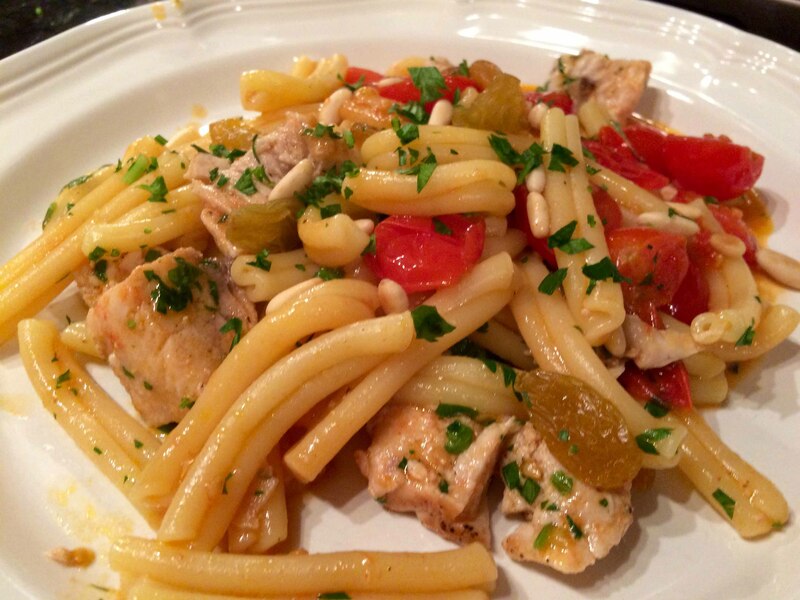 Cook pasta in a large pot of boiling salted water, stirring occasionally, until al dente. Drain, reserving 1 cup pasta cooking liquid. Serve pasta topped with raisins, pine nuts, and remaining parsley. Here’s a link to the recipe on Bon Appetit. 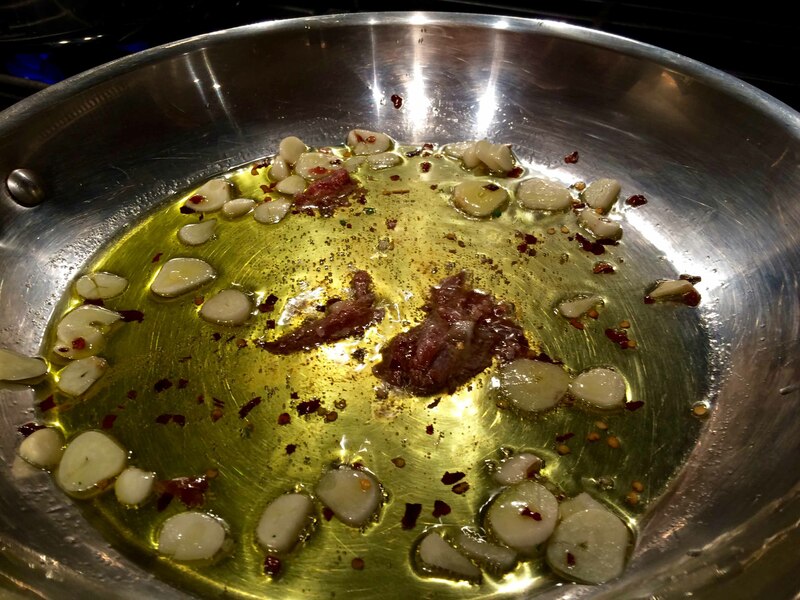 For me, one of the most attractive characteristics of Italian cooking has always been its simplicity–its recipes with minimal ingredients and simple preparation. As I child, I used to watch my mother and aunt in the kitchen turn out multi-course dinners for us, night after night, without breaking a sweat. They cooked from memory the simple dishes with which they themselves grew up. One such dish was baked fish coated with breadcrumbs, which hailed from my mother’s Sicilian family. 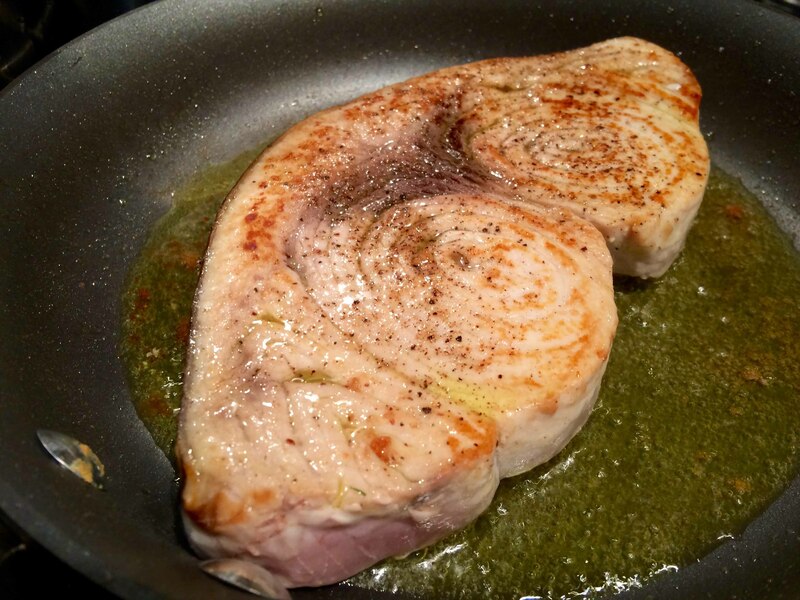 Yesterday, when I came home from the fish market with some beautifully fresh swordfish, I thought I would try to recreate my mother’s dish and started looking for a recipe. My search led me to one from Arthur Schwartz’s The Southern Italian Table: “Pesce Spada Impanata,” or Swordfish Breaded Palermo Style. Thin cutlets of swordfish are coated with seasoned bread crumbs and quickly baked. The savory, garlicky coating perfectly complements the subtly sweet, meaty flavors of the swordfish. I served the fish accompanied by another of my mother’s favorites, string beans sautéed with garlic and oil. Brush the fish slices lightly with the remaining tablespoon of oil and season lightly with salt and pepper. 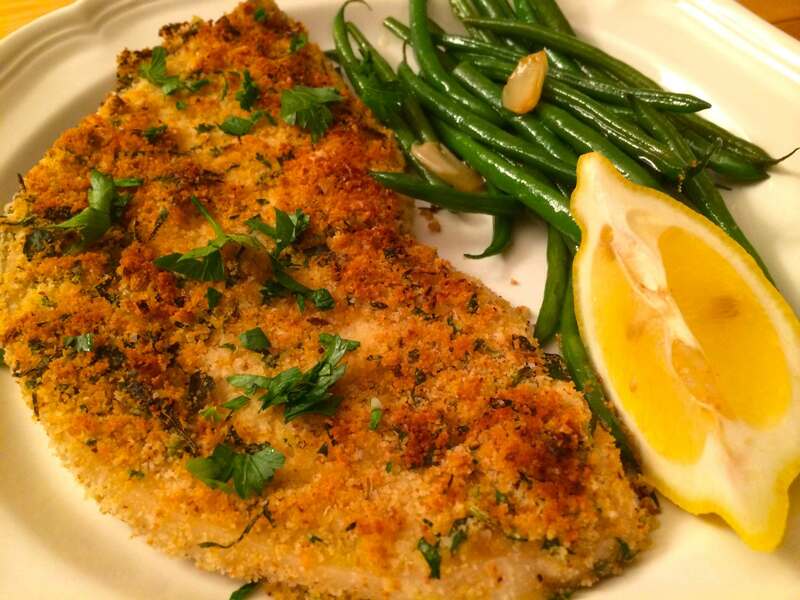 Dredge each slice in the seasoned bread crumbs, pressing the crumbs into the fish so that each side is well coated. Arrange the fish slices on a baking sheet. Bake the fish for 5 to 6 minutes. Serve hot or at room temperature with lemon wedges. My Note: Be sure to have your rack on the highest rung possible of your oven and to use a baking sheet without sides as opposed to a sheet pan with sides. Doing so will help the breading get more color. I did not have a baking sheet and had to put the fish under the broiler for the final minute or so to lightly brown the crumbs.